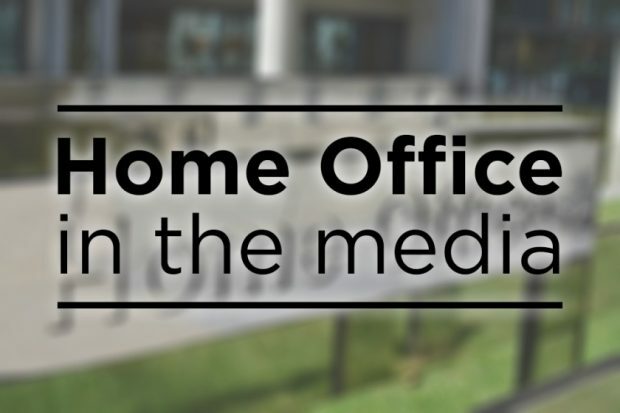 Today's Home Office stories include the Police Federation's dispute over police pay, the visa extension granted to an NHS couple, and the Court of Appeal ruling on the Dubs Amendment. There has been reporting today that the Police Federation, the body which represents rank-and-file police is poised to launch legal action against the Government over its pay rise for police. Earlier this year, the Home Office announced officers would be awarded a 2% pay rise in 2018 to 2019. But the Police Federation chairman John Apter has described the 2% rise as a "betrayal". "We are grateful to all police officers for the incredible job they do - and will continue to ensure they have the resources they need to do their jobs effectively. "The police pay award for 2018/19 represents the highest consolidated pay award since 2010. And the number of people joining police forces is at a 10 year high which demonstrates policing is still a desirable and sought-after career. "We are unable to comment, however, on potential future legal proceedings." The Sun reports that a doctor and his wife who is a nurse have been allowed to stay in the UK. The paper says the Home Office asked the couple to leave after they wrongly claimed child benefits, but they repaid it when they realised their error and have now been granted a visa extension. Many of the papers report on the Court of Appeal ruling on Wednesday on the Dubs Amendment. The Guardian and Times lead with the point that the Government’s consultation with local authorities which determined the number of children who were to be brought to the UK, was legal. The Independent leads with the partial win by the charity Help Refugees, as the court ruled that the Government broke the law in its treatment of child refugees who were rejected under the Dubs scheme.